Selene is an audio/video converter for converting files to OGG/OGV/ MKV/MP4/WEBM/OPUS/AAC/FLAC/MP3/WAV formats. It aims to provide a simple GUI for converting files to popular formats along with powerful command-line options for automated/unattended encoding. Encode videos to MKV/MP4/OGV/WEBM formats. Encode music to MP3/AAC/OGG/OPUS/FLAC/WAV formats. I’m new to ubuntu. I’ve installed selene encoder with terminal and want to convert some music files. How? 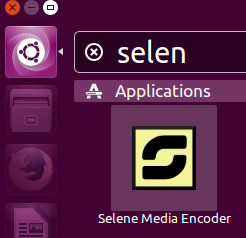 Hi again: I’ve just installed selene media encoder again in my ubuntu 15.04 but cannot find how to run it.